Unique Design: cute elephant design with bright color makes meal times more fun for kids. Quality and Safety Materials: FDA standard 100% Food Grade Silicone, safety for kids. 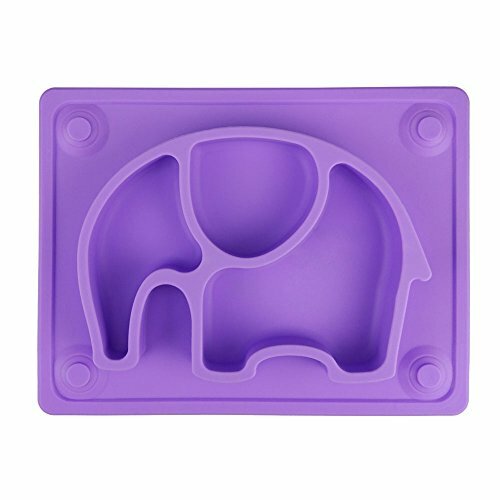 Unique Design: cute elephant design with suction cup makes meal times more fun for kids. The mini size make it fits most highchair trays. Easy to Carry: This mini kids' placemat is lightweight and compact, so it is perfect for dinners out and travel. Easy to use: Safe for Dishwasher, Microwave, Oven, and Freezer. Make Feeding Easier: One-piece silicone baby/toddler placemat with combined plate Helps eliminate tipped bowls/plates and mealtime mess. If the table surface is SMOOTH FLAT enough, such as glass table, It can stick on the table, make feeding time easier. If you have any questions about this product by SILIVO, contact us by completing and submitting the form below. If you are looking for a specif part number, please include it with your message.